This book has a history. It has emerged from the growing ranks of exploratory and resistant walkers, walking artists, drifting groups and disrupted pedestrians. Drawing on often disparate groups and lone wanderers, Mythogeography gathers possible philosophies for the fuelling of a new practice of interventional and perceptual walking; at war with official life and characterised by its theatricality and multiplicity. Mythogeography reveals an underworld of resistant pedestrianism through the notebooks, pilgrim diaries, doodles, polemics and transitional programmes of its practitioners. From the transnational pilgrim to the person who ‘drifts off’ on the way to the shops, Mythogeography addresses the means, uses and consequences of ‘walking sideways’, of deploying the ordinary act of walking as a lever to prise off the lid of everyday life. This book is not entirely conventional. It consists of an assemblage of sometimes unreliable, sometimes fractious documents hung around a flawed, yet epic tale of a journey in search of oak trees. It floats numerous narratives around this travelogue, weaving a matrix of possible trajectories for the reader from passive contemplation to wild pilgrimage and activist pedestrianism. The book’s second half contains advice, tasks, guidance, kits and mental maps: a toolbag of information and suggestions for the reader who wants to take the next step. Mixing entrepreneurial drive, rambling discourses and post-dramatic performance with soft architecture and post-politics-politics, Mythogeography is a guide to strolling in the cracks in the pavement and a means to walking out on the Spectacle. In particular, it seeks to undermine monolithic approaches to, and the ‘industries’ of, Leisure, Art, Health, Fun, Geography, Tourism and Heritage. 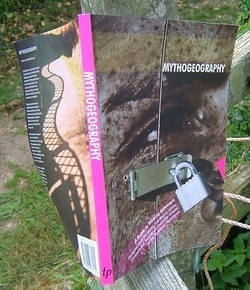 Mythogeography is a handbook for tripping up the ordinary. Drawing on a history of Dadaist deambulation, situationist dérive, dematerialised land art, mad-dog marketeering and activist intervention, it weaves between totalising utopias and defeatism, while skulking in holey places, trading under fake colours and planning its next false flag operations. It provides a series of theoretical investigations into the underpinnings of resistant walking – in myth, in cellular and spiral organisation, in the dematerialisation of sculpture and the ‘tight organisation’ of the drift. All this in the guise of a mystery about walkers. Deceitful and hopeful, this is the first manifesto of a new kind of everyday. OK, let me buy the book. I understand there is a Lovely Edition and an Economical Edition. How much are they and where can I order a copy?